On March 25th WORLD CLUB DOME Zero Gravity: The Platinum Edition, went down as a massive success as the most extravagant festival pre-party in world history. Between the 50 VIP passengers on board from all around the world, the event attracted people of all nationalities and backgrounds, who raised each of their country’s flags with pride. This event was held in collaboration with the European Space Agency (ESA) and Frankfurt Airport (Fraport), and their wild goal for this event to occur was all thanks to BigCityBeats with this second edition of WORLD CLUB DOME Zero Gravity. The passengers were taken on a trip into another dimension, and was not only the pre-party for WORLD CLUB DOME ‘The Space Edition’ in Frankfurt this June, but also to commemorate the 50th anniversary of the moon landing. As a result, BigCityBeats is celebrating ‘A Year in Space’ and wants to support space travel on a global level. Overall, they are attempting to enunciate the overlap between music, sports, fashion, film, TV, entertainment, and space. Participants traveled from Frankfurt to other countries, and the guest list included Orange is The New Black star, Dascha Polanco from the Dominican Republic, YouTube and Instagram influencer, Amanda Cerny from the United States, Eintracht Frankfurt players Sébastien Haller and Fredi Bobic from Germany, top-tier DJ Timmy Trumpet from Australia, popular electronic artist DJ Soda from Korea, popular artist DJ Kaka from China, DJ Le Shuuk from Germany, Olympic champion Fabian Hambüchen from Germany, SwankyTunes, the most successful electronic export from Russia, Top chef Tim Mälzer from Germany, the most prominent Pop-Rap group Fantastischen Vier from Germany, and the German/American influencer couple Caro Einhoff and Jeff Kasser. All of these attendees meant that they would be the first individuals to own their craft in complete weightlessness. 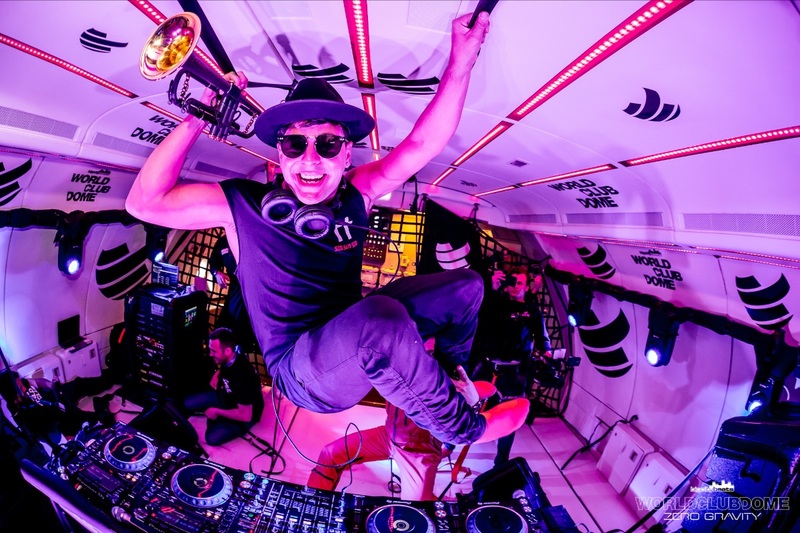 Timmy Trumpet became the first DJ to play the trumpet in weightlessness, Tim Mälzer became the first chef to create a salad dressing in Zero Gravity, Sébastien Haller and Fredi Bobic scored the first goal in weightlessness, DJ Le Shuuk became the first DJ to celebrate his new song release ‘Gold Baby’ in Zero Gravity, and Fabian Hambüchen did the most somersaults while hovering in the air. Platinum edition made history and milestones a handful of times over the course of this one event. All of these celebrities got as close as possible to the real space experience and bonded with other passengers on the specially converted A310 due to all of the international astronauts and ESA members on board. At the official press conference many of the celebrities who attended had words to share in support of this one-of-a-kind event. There was a livestream that was tuned into by people from all over the world, and this further suggests the international weight of this breathtaking event. It brought people together for their shared love of music, entertainment, and space. In a place with no limits, Sébastien Haller attempted to DJ by taking the decks next to DJ Le Shuuk and Timmy Trumpet. This was yet another historical first. BigCityBeats works hard to defy traditional clubbing, and with WORLD CLUB DOME, they continue to have ground-shaking events by creating once in a lifetime experiences for their fans. Top quality events are constantly delivered in unique locations around the globe.